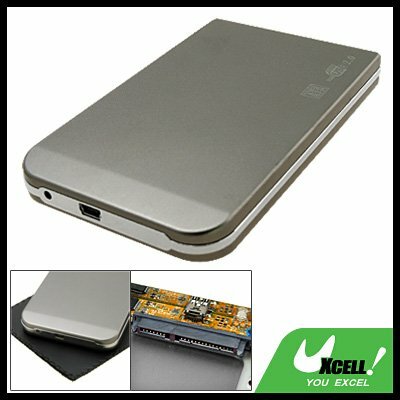 * High quality external storage system for 2.5 inch hard disk drive! * Coverts your 2.5 inch hard drive disc into an external hard drive for more flexibility and convenience. * Fits all the 2.5 inch SATA hard drive disk. * Easy portability and installation of this 2.5" SATA HDD Case. * The transmission interface conforms to the standard specifications of USB 2.0 / SATA, and is compatible with the USB 1.1 interface. * 2.5" SATA HDD Enclosure supports plug & play and hot-swapping. * Made with sturdy aluminum magnesium alloy material. * The 2.5" SATA Hard Drive Case support Windows XP, 2000, ME and VISTA.